The ski area of ​​SkiWelt Wilder Kaiser-Brixental is one of the most famous and popular destinations for a winter sports holiday in Austria. Certainly among the Dutch and the British the SkiWelt has been a longtime-favorite destination. The entire ski area counts no fewer than 284 kilometers of slopes and is therefore one of the largest interconnected ski areas in Austria. The SkiWelt offers a good choice of nine different Tyrolean villages, from traditional, quiet Scheffau to the more bustling Söll and Westendorf. There is something to suit every lifestyle and every level of skiing. The SkiWelt is above all known for it's pleasant atmosphere, lively apres-ski and family friendliness. The SkiWelt promises a stress-free holiday for the whole family. For families with children it seems just a perfect getaway. There are plenty of opportunities for young ones and beginners to learn how to ski, as well as a heap of gentle blues to help get novices well on their way - Going, Ellmau, Scheffau and Westendorf in particular have some lovely blues leading down to each resort. All of the SkiWelt villages, except south-facing Brixen and Hopfgarten, have dedicated nursery and beginners slopes at the bottom of the mountain. Moreover, there are well over 20 ski and snowboard schools in the SkiWelt, renowned for having some of the most friendliest staff. Exciting Kinderland practice areas are either located at the base of the resort slopes or at the mountain stations of the gondola lifts. If your little ones are a bit too young to ski, this is no problem as many of these ski schools offer childcare, which will keep your children entertained and set you free to roam the slopes. There are childcare facilities in the villages as well as on the mountain. Many lifts in the SkiWelt are specifically designed for children’s safety You will find family-friendly cabins throughout the ski area. Add to this the wide, perfectly groomed slopes and easy valley runs and your family holiday fantasy is complete! And, don't forget that children up to the age of 15 ski free of charge in low season if they are accompanied by a an adult. Families who are looking for peaceful relaxation should consider Scheffau or Brixen im Thale. Also, Ellmau is also a very suitable location for children and families. The SkiWelt is an alliance of six lift companies and together they offer a sophisticated network of well-maintained interconnected pistes. The efficient lift system gets you up the mountains quickly and majority of chair lifts are modern, shielded with a hood, heated and quite speedy. The Skiwelt is big by any standard, and one of its distinguishing characteristics is the profusion of blue and red-rated runs. Literally, the slopes are close-knit which makes this huge ski area feel very compact and comprehensible. From nearly every position in the ski area there are several options to proceed in either direction. Some may say that the slopes are relatively short, but that's not true, it is merely a byproduct of the winding and intertangling nature of the slopes. Bear in mind that there are many long top-to-bottom descents which drop through 1000 vertical metres. In total there are 21 exciting downhills in the SkiWelt. The ski area -which is open from December to April- has just about something for everyone but is better known for its beginner and intermediate slopes. The SkiWelt is perfect for intermediates and mixed ability groups and there is also a wide selection of runs for beginners. You can ski excellent runs from anywhere in the SkiWelt area. There’s a decent amount of excellent skiing immediately in the vicinity of Söll and many will choose to spend time on these slopes. However, the best runs are actually over the back from Ellmau/Scheffau going down to Brixen im Thale. The run at the Mittelstation at Hopfgarten declares itself as the best run in the Skiwelt and it would be hard to argue with that. Probably one of the loviest and longest is the Ki-West descent from Westendorf to the Kitzski area. There aren’t many steep blacks in the SkiWelt, and you won’t find more than a couple of death-defying couloirs either. But there are some cracking black runs like the one down from Hohe Salve to the Rigi peak. A challenge awaits those who embark on the Morderer ski route from Brandstadl towards Scheffau. One of the steepest slopes in Austria with a gradient of 80% leads from the Choralpe to Westendorf. A total of three ski circuits have been mapped and these tour plans take you to different parts of the ski area and offer you fabulous inter-changing sceney. One of the most popular safaris is the 'Hohe Salve tour' - a cicular route around the highest peak of the area, with fantastic 360-degree views of the Wilder Kaiser mountains, the Ziller Valley mountains, the Hohe Tauern range and Austria's highest mountain, the grossglockner (3,798m). During the 'Kaiser Runde' you can enjoy the most beautiful views of the Kaiser mountains. 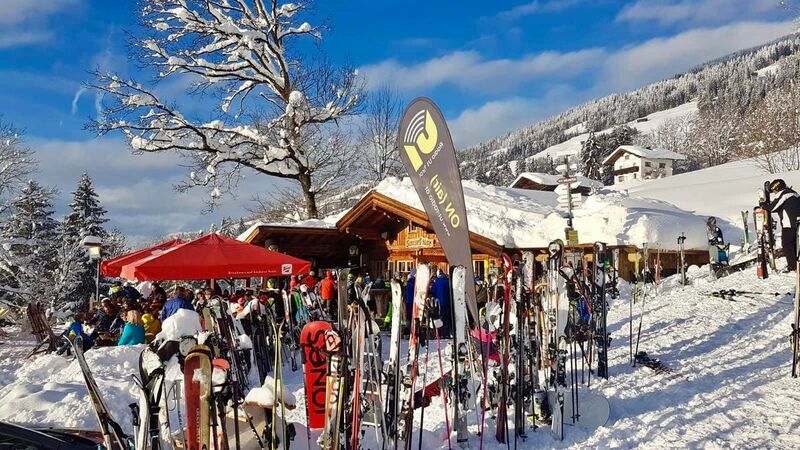 You will discover Westendorf and enjoy the Kitzbuhler Alpen with the 'Westendorf Runde'. There's certainly more than enough groomed skiing to keep even the best skiers busy skiing different runs all week! Many ski resorts in the Alps boast night skiing, usually no more than a flood-lit beginner slope on the edge of the village, but Sőll is home to the biggest night skiing area in the Alps with 13km of floodlit skiing on including a 3km flood-lit valley run back to Söll. There's excellent night skiing Wednesday - Saturday between 6:30pm and 9:30pm from mid-December to mid-March (flood-lit on the valley descent until 10:30pm). So, If you've still got some energy left after regular business hours, head for Söll, home to Austria's biggest flood-lit ski area. Equally as exciting, and great for non-skiers too, are their tobogganing runs which are also open after dark. The majority of the pistes in the SkiWelt are lined with trees, and that means you’re going to be able to ski whatever the visibility is like. The trees add shelter from the wind too. Something neighbouring Kitzski is more prone to. It’s rare indeed for the lifts in the Skiwelt to close because of wind. There are a large amount of great cafes and restaurants with sensible prices where you can have coffee, beer or a delicious apfelstrudel. Almost all restaurants have excellent traditional cuisine. The SkiWelt is a very culinary area. You do not have to search long for an authentic mountain restaurant. More than 70 can be found in the SkiWelt. Panoramarestaurant Bergkaiser offers high-quality cuisine at a reasonable price in a friendly atmosphere and with wonderful panoramic views. Gipfelrestaurant Hohe Salve and the Bergrestaurant at the top-station of the Brandstadl gondola have a large sunny terrace and wonderful views of the Wilder Kaiser. The charming Rűebezahl-Alm overlooking Ellmau is among the best mountain restaurants in the SkiWelt and well worth visiting at least once. The Alpenrosenhütte in Westendorf is also highly recommended. The SkiWelt is at low altitude even for the eastern half of the Alps which has a colder climate than the western half. Most of the skiing is between 800 and 2000m. With important links that get a lot of sun, the snow on the lower slopes tends to suffer somewhat in warm weather even in good seasons. Therefore, you would prefer to come in the middle of cold, snowy winter months to get the best of it. The mid-season (late January to early March) is probably your best bet. In spite of the Wilder Kaiser's relatively low altitude, in recent years the region has proved doubters wrong with fantastic snow cover and heavy snow fall at times. The snow depth usually exceeds that of neighbouring KitzSki. The lift companies of the Skiwelt can keep its 284 kilometers of slopes and the 21 valley runs in great condition with natural snow. Actualy they do a superb job here. In the event that the snow depth is insufficient or snow qualiy is below-par, there is abundant modern equipement to cover the slopes with human-made snow. More than 80 per cent of the SkiWelt is covered by environmentally responsible snowmaking, part of one of the most cutting-edge infrastructures in the Alps. In the SkiWelt Wilder Kaiser - Brixental a whopping amount of 1.700 snow guns are available for this purpose. In addition, an innovative GPS-controlled slope management system enables snow bullies to groom the slopes more evenly. Thus, transporting less snow and guaranteeing a minimum cover of snow on all slopes. It's pinpoint accuracy: nowhere with too much or too little snow. The water used for snowmaking is of drinking water quality and is pumped from one of the 15 reservoirs with a total capacity of more than 1,200,000 m³. They automatically fill up in the summer with precipitation. The artificially produced snow is free of harmful additives and can thus be included in the natural water cycle when the natural snow melt again. The reservoir lakes are designed so that they fit well into the the natural environment of the Kitzbühel Alps. In summer, they are even popular destinations for hikers. In addition, the SkiWelt Wilder Kaiser - Brixental relies entirely on green electricity for the production of artificial snow for the operation of the 1,700 snow guns. In addition, some lift stations were equipped with their own photovoltaic systems. The SkiWelt encompasses 9 villages in the northern Kitzbüheler Alps: Söll, Scheffau, Ellmau, Going, Itter, Kelchsau, Hopfgarten, Westendorf and last but not least, Brixen im Thale. Whilst each village has its own character and attractions, one thing they all have in common is traditional Tyrolean style - with ancient baroque churches and classic wooden architecture, these are some of the most beautiful and unspoilt villages in Austria. Brixen im Thale is at the heart of the Skiwelt, it is a popular ski resort with a very friendly atmosphere. From the valley you can take the gondola to Hoch Brixen to continue to for example Söll or Ellmau. But you can also take the gondola to the area of Westendorf and then Kirchberg and Kitzbühel (KitzSki). The best cross-country skiing opportunities in the SkiWelt are in Brixen im Thale. Ellmau is a very popular ski destination among Dutch winter sports enthusiast. But you will also find many English and German winter sport enthusiasts. Ellmau is an attractive, quiet resort with the best views of the iconic Wilder Kaiser mountains. Ellmau is popular with families and couples looking for great skiing plus traditional Austrian character. The beginner slopes and ski school meeting place are conveniently central. Most of the slopes that belong to Ellmau and Going are on the north side of the mountains and are therefore open the longest of the Skiwelt area. The snow conditions are often good and there is plenty of snow. Scheffau is one of the loveliest villages in the area. Its charming centre is only a kilometre away from the main gondola and on a central point in the SkiWelt circuit, Scheffau has lot's of piste to explore. Staying in Sheffau is the way to go if you want to ease into your skiing or prefer blues and gentle reds. There’s also plenty for the less adventurous, with impressive nursery slopes and a relaxed, informal après scene. Scheffau's wide, gentle runs and excellent ski school make it perfect for beginners. Although Scheffau is low altitude, the north-facing Brandstadl Bowl has arguably the best snow record. A long-time favourite with British skiers and boarders, Söll is a lively resort lying at the foot of the famous Hohe Salve mountain. It’s the main resort in the Skiwelt Söll which is one of the larger and more lively resorts in the area and is great for groups of mixed ability skiers. Söll has one of the longest and most challenging toboggan runs you will encounter in the Alps. Off the mountain be prepared for some lively après and varied nightlife. Hopfgarten, located at the foot of the Hohe Salve, is known for having the sunniest slopes in the entire SkiWelt. It offers wide, impeccably groomed slopes that are ideal for both families and beginners as well as for expert skiers and enthusiasts. A modern 8-seater gondola whisks skiers directly to the summit of the Hohe Salve (1,829 m). Westendorf is a charming little village in a wide, sunny valley with plenty of gentle mountain slopes. 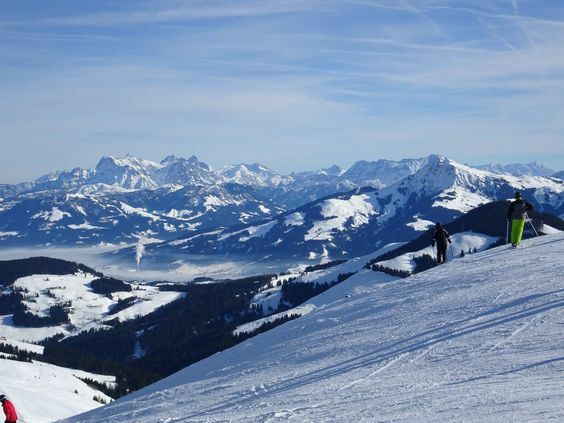 With a vast amount of terrain for all levels of skier and boarder, Westendorf is a long-term favourite for beginners and intermediates. Amongst other facilities, there’s a nursery slope, an extensive Funpark, a floodlit slope and a large number of restaurants and après-ski bars. You will find this village on the edge of the SkiWelt and neighbouring Kitzski. Via the Ki-West connection you can even ski down to Kirchberg and Kitzbühel. Altogether you have more than 400 km of slopes at your disposal. By any standard the Skiwelt is a huge ski area, but at the same time it feels very compact or even 'modest'. There are loads of options for every skiing ability without being overwhelmed or intimidated by the plethora of challenges. The ski area is immensely beautiful, the backdrop with the Wilder Kaiser mountains is second-to-none, almost providing a dramatic element to the scenery. Most of all, the SkiWelt has heaps of character. It is one of the few authentic ski regions in Austria. At the same time it is very sophisticated and modern. The infrastructure - both ski lifts and snow equipement - are state of the art and guarantees perfectly groomed pistes and the best snow quality under any circumstances. Although the SkiWelt is very popular, you will hardly see any queues. We had not come across any other ski resort that makes so much effort to make people feel welcome. especially families. The SkiWelt is in short distance from the German border. The main gateways to the SkiWelt are Innsbruck, Salzburg and Munich airports. The nearest airport is Innsbruck (78km) which is 1 hour from Soll by car or allow 2 hours if using public transport. Transfer times from Salzburg and Munich airports to Sőll are also quite quick by car. Innsbruck is served daily from London Gatwick, and twice weekly from Liverpool and Bristol, by EasyJet. Transavia flies several times a week from Rotterdam/The Hague, Amsterdam and Eindhoven to Innsbruck.